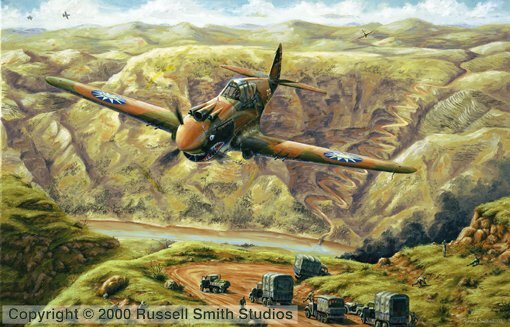 The Bite of the Tiger is a painting depicting Col. Ed Rector in #36 P-40 Warhawk during the decisive strikes by the Flying Tigers against the Japanese Army advancing up the Burma Road. As the Japanese convoy began the treacherous descent into the Salween Gorge crossing into China, the AVG struck with deadly accuracy, strafing and bombing the Japanese while the Chinese destroyed the bridge across the river. The attacks would continue for four days, finally causing the Japanese troops to stop their advance. As a result of the attacks, the Japanese Army never entered China via the Burma Road. I worked closely with Col. Rector during its creation to ensure accuracy. Printed on 100# acid free stock, the edition consists of 500 prints plus 50 Artists Proofs. Each print is individually signed and numbered by Russell Smith and countersigned by the late Col. Ed Rector.